When traveling to Aberdeenshire in Scotland, you should ask yourself what the top reasons to visit Balmoral are. Balmoral is a castle and estate located in Aberdeenshire and one of Scotland’s precious treasures. Here are a few reasons why you should go to Balmoral during your trip to Aberdeenshire. Balmoral Estate is not just any estate. It is a privately owned property of the British Monarch. Queen Victoria purchased the estate in 1852 along with her consort, Prince Edward. Since then it had belonged to them. Upon its purchase, they found the estate house too small and replaced it with the Balmoral Castle. There are many things that make Balmoral Castle an interesting attraction. First of all, the castle was ordered by Queen Elizabeth and has been royal property since its construction. Second, while it was designed by William Smith of Aberdeen, Prince Albert made altercations and them too. 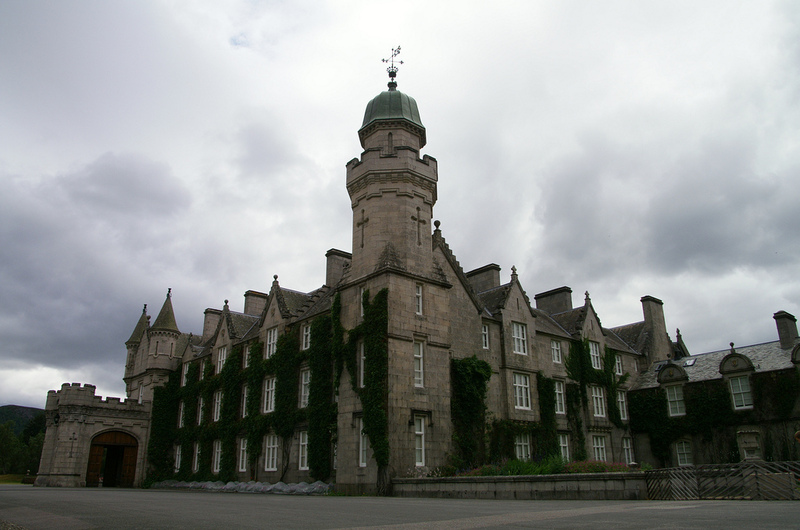 Third, Balmoral Castle has a Scots Baronial architecture. It is an architectural style that originates from the 16th century and draws on the features of Medieval towers and castles and French Renaissance chateaux. Perhaps one of the top reasons to visit Balmoral Castle is that Historic Scotland categorized it as a “category A” structure. Therefore, it is of great national importance whether it has to do with architecture or history. It covers more than 50,000 acres of ancient Caledonian woodlands and hills filled with heather. The stunning River Dee is located nearby too. Over the centuries, stewards of the Balmoral Estate preserved the architecture, wildlife, and greenery within its reach, creating an environment that is close to nature. Balmoral Estate may be royal property but it is open to tourists. Even though it isn’t available all year round, it is open from April until July each year. During these months, tourists are allowed to explore the estate gardens, grounds, and Castle Ballroom. Its availability to tourists is one of the top reasons to visit Balmoral. 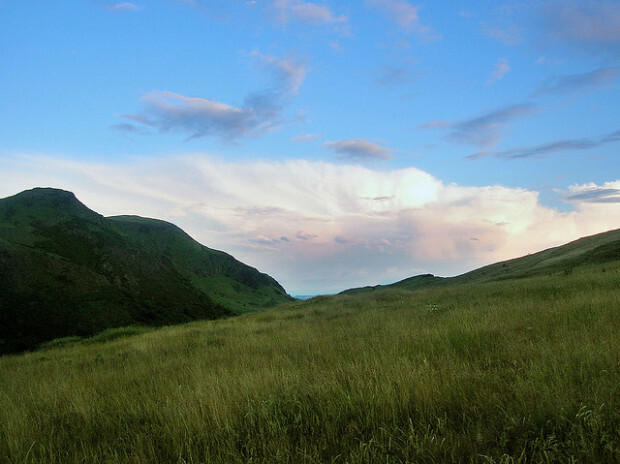 Check Out The Active Side of Edinburgh! We all know Edinburgh is world famous as a mecca for culture and history lovers but what if you’re happier getting active out and about than wandering round an art gallery on a Saturday morning? Well the good news is that Edinburgh has a dazzling choice of activities to keep even the most energetic adrenalin junkie happy. Also, the fact that Edinburgh’s Travelodges are dotted all over the city means that you’re never too far from a comfortable bed to rest those thoroughly worked-out bones. Yes, you can squeeze in a bit of slope action on your city break at Midlothian Snowsports Centre, located in the shadow of the Pentland Hills on the outskirts of the city. Whether you’re an old pro at skiing or snowboarding or a complete newbie, you’ll find something to suit you here. There’s also tubing, which is bound to be a big hit with the kids. But if you’d rather poke your own eyes out than don a pair of skis, why not just enjoy the views from a chairlift ride then settle down in the café with a good book while the others wear themselves out on the slopes? Pack your walking boots because Edinburgh has some stunning walks that combine exercise and sightseeing perfectly. A hike up the extinct volcano Arthur’s Seat will reward you with the most stunning panoramic views of the city and the sea beyond. Alternatively, walk up Calton Hill to see the unfinished National Monument and find out for yourself why Edinburgh is nicknamed the Athens of the North. A climb to the top of the Scott Monument (no there aren’t any lifts!) will reward you with yet more incredible city views. When you first see the climbing area at Edinburgh International Climbing Arena, you could be forgiven for feeling a few butterflies in your stomach. This dramatic arena is challenging enough to have been host to the British Championships, but don’t let that put you off – they cater for everyone from total beginners to expert Spiderman wannabes. The arena is also home to a fabulous café and Scrambles, a modern, spacious soft play centre that means even the tiniest climbers in your family will be kept entertained. As befits the hometown of Olympic cycling hero Sir Chris Hoy, Edinburgh is a fantastic city to cycle in due to its relatively small size and abundance of green open spaces (watch out for those hills though!). So much so that it’s celebrating all things two-wheeled with the Edinburgh Festival of Cycling between June 12th and 22nd. If you’re not around then, you can still enjoy the biking life by looking up safe and pretty cycle routes from Edinburgh Council’s website. All these ideas have hopefully given you food for thought for an action-packed city trip. But don’t forget Edinburgh is a great city to see on foot, so even if you’re just wandering from shop to gallery, you’ll be getting a good workout! While some people might opt for a beach vacation during Christmas time to avoid the cold, many prefer to swirl themselves into the winter cheer. Europe offers many great destinations for Christmas time to get into the spirit, even for a lonely Jew like me! One such place is the capital of Scotland, Edinburgh with it’s majestic city center. It will make for a great city break from November to January when the city gears up to try and attract winter-loving tourists. Check out some cool things Edinburgh offers! 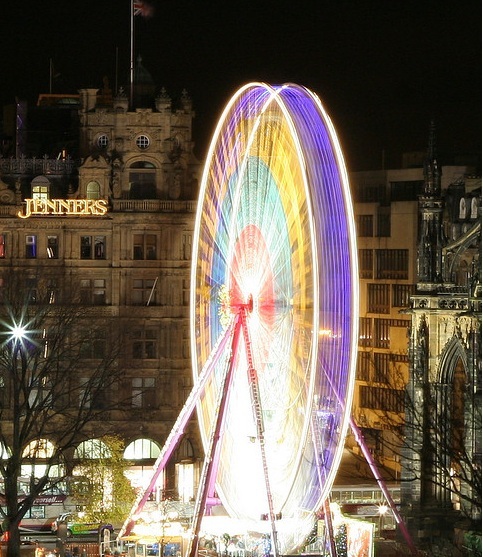 Formally the Wheel of Manchester…because that’s where it was, the Edinburgh Wheel is a new attraction in the capital city that you can enjoy day and night. It overlooks Princes Street and the beautiful gardens beyond. 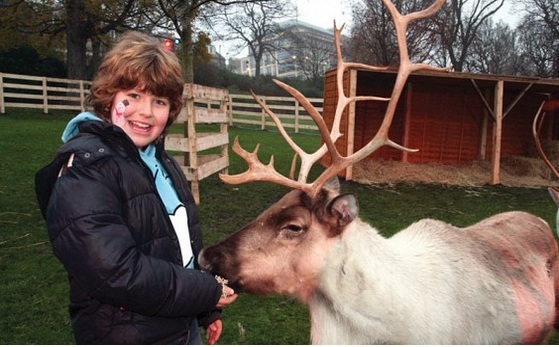 If you’ve got the kiddos in tow, then make their Christmas come true with the chance to pet a real reindeer at Christmas in St Andrew Square. They will be there select dates in 2012, December 9th, 14-16th and the 21-23rd. 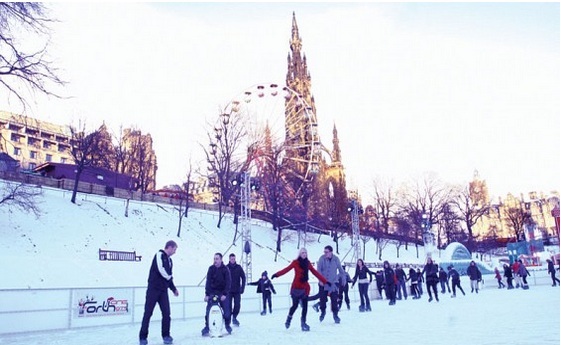 One of the city’s most popular attractions during the winter time, the outdoor, Edinburgh Ice Rink is fun for the whole family. It’s located right near the Edinburgh Wheel in East Princes Street Gardens and only costs a few pound to enjoy.